Back around the turn of this century (my, do I feel old saying that!) 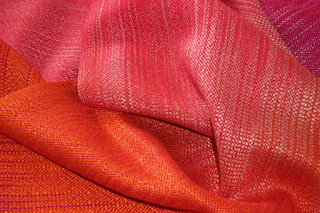 I wove a bazillion rayon chenille scarves until, frankly, I was pretty sick of them. They were a good thing to do at that time. 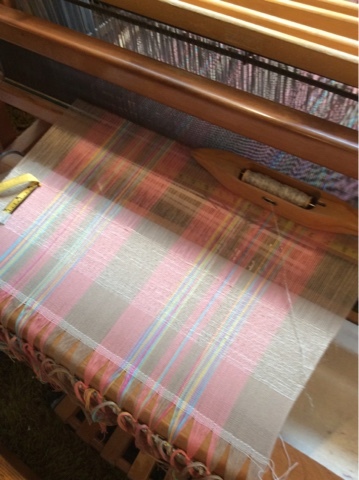 Each warp was five meters resulting in two scarves. In order to weave them quickly I concentrated on plain weave and coloured stripes of various combinations. 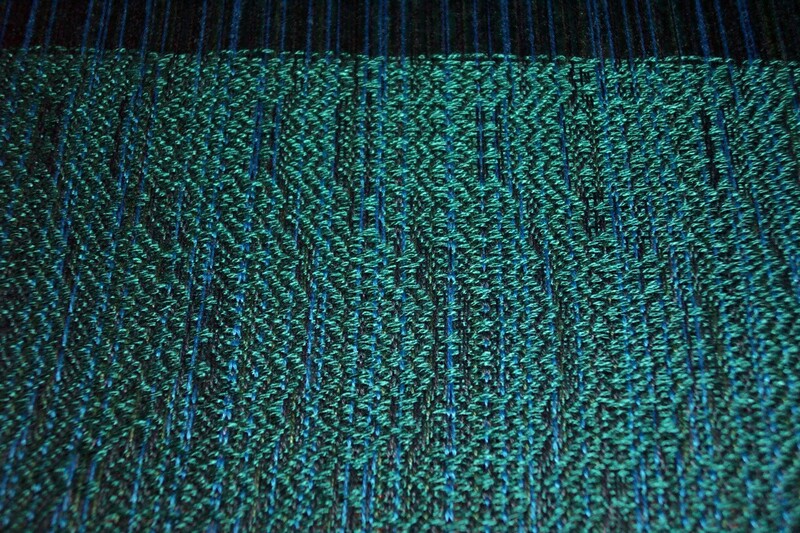 When I got tired of doing them I had learned an enormous amount about Colour interactions in plain weave and gotten really good at weaving plain weave. I don't regret doing them, although I was reluctant to return to doing them again. But I have all this rayon chenille...probably 50 pounds, maybe more. And I was out of inventory of scarves. 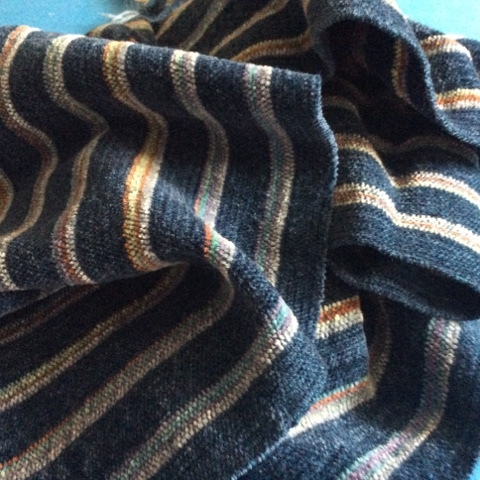 Since I really did not want to produce exactly the same thing, knowing I really needed to use up the yarn, I bit the bullet and designed a stripe sequence and started weaving scarves. 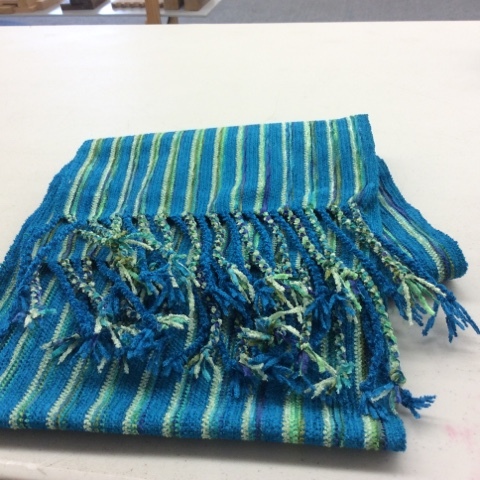 A warp winding elf offered to wind some warps for me and having her in the studio, all new and enthusiastic gave me a much needed energy boost and I have a small but growing stack of scarves. And already variations are beginning to percolate. Part of that is necessity. I'm getting very low on variegated rayon chenille and some colours and I really do not want to buy more. I am also running out of time before the sale season begins. 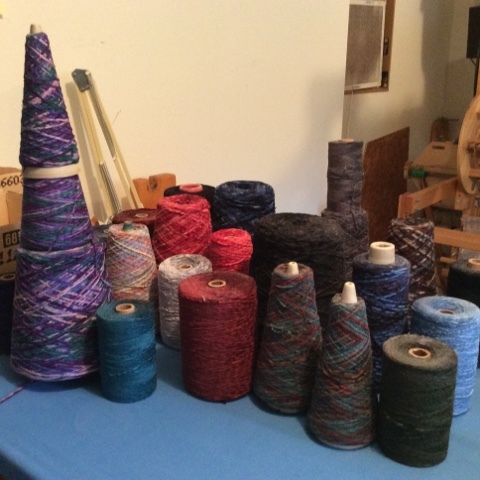 My explorations into this interesting, and at times demanding, yarn is going to continue for a while. With deadlines for shows rapidly approaching, I feel like I'm racing towards a finish line. 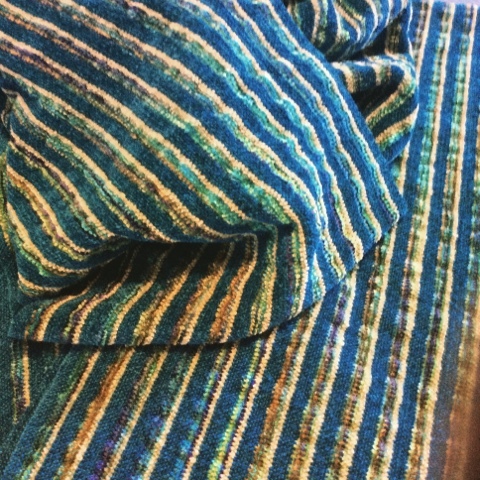 I'm so low on rayon chenille scarves that I am trying really hard to get a bunch woven, even at the expense of doing some other stuff that doesn't much appeal to me. I am being aided and abetted by a friend who has been coming to wind warps for me. Today she got two more done and will come back tomorrow morning. 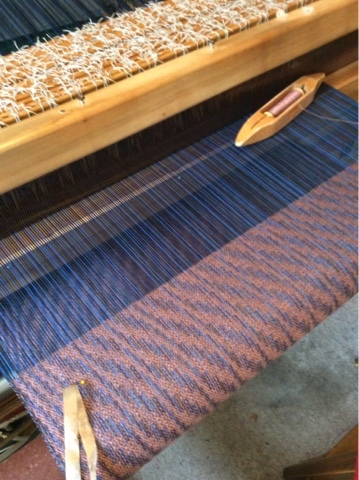 Today I dressed the loom with a warp (each warp yields two scarves) and wove them off. 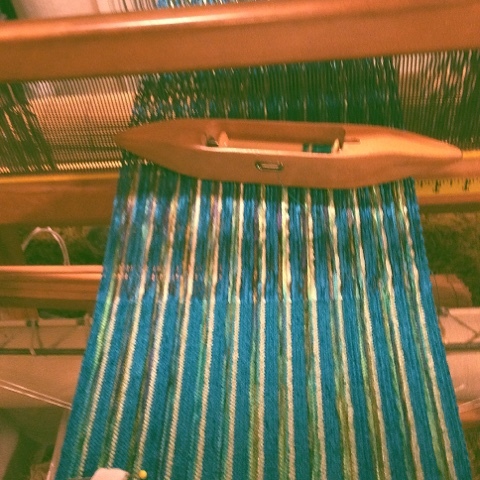 Just now I beamed this warp and expect to get it weaving before dinner. But not if I don't get over there and just do it! One of the things you must do if you are selling your textiles is to have 'proper' labels. Since the definition of 'proper' is a legal one it is a good idea to know what the laws are for you. In Canada, labels for garments are required to be permanent (must withstand 10 cleanings), must have the fibre content in both official languages and care instructions. Fashion accessories and household textiles don't need to be permanent. You must also supply contact info. 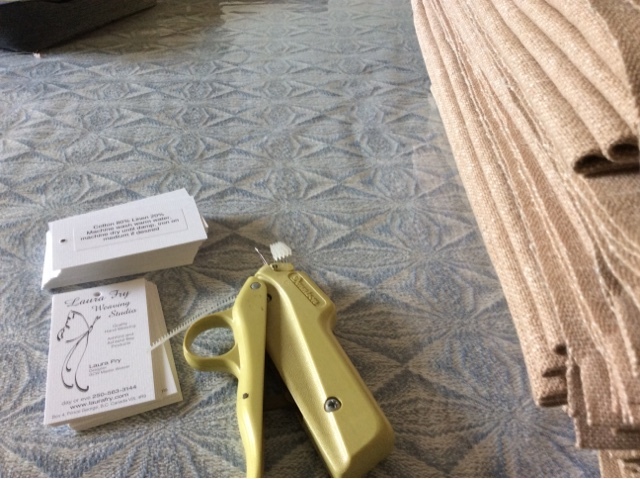 I don't make garments to sell so I combine the above information on my hang tag and attach using a plastic stem gun. The price is affixed to the tag on a small sticker that can be peeled off if it is a gift. Getting the tags onto the textile is time consuming and fiddly but it must be done. Therefore I do it. Stack of towels awaiting their hang tags. Since I'm leaving for a 12 day trip next week, and the show season begins the week after I get back, perhaps I have been a trifle optimistic? Colours are not true. More green than blue. After wet finishing. 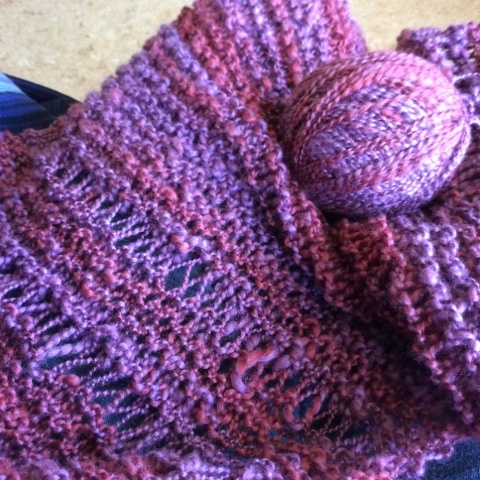 The variegated yarn is acrylic, not rayon so it doesn't feel as nice as all rayon. Plus the acrylic didn't shrink so it seersuckered, but I expected that and, because it is consistent, it's a design feature. Not a great photo but the colours of the scarf are pretty accurate. A friend offered to wind rayon chenille warps for me and before I put a new line into production I figured I'd better get a prototype made to make sure I was going to be happy with it. As of this morning, total page views of this blog are nudging the 800,000 mark! August of this year marked the 7th anniversary of entering the blogosphere. Life has had it's share of ups and down, great joys, some sorrows. But that is life, after all. The good becomes sweeter once you have experienced 'bad'. The trick, I've found, is to not get stuck in the bad. Feel the fear - and do it anyway. Yadda, yadda. The reason these things are cliche' is simply because they describe an essential truth, one we need to remember, especially when having a 'bad' time. Getting 'old' is not guaranteed, after all. I have had a very full life but it hasn't all been wonderful by any means. A bed of roses isn't very comfortable if the thorns haven't been removed - and they rarely are! Recently I was lamenting to a friend that my brain power has really been compromised - that I have trouble wrapping my brain around concepts. Learning new things. I also feel that, after a lifetime of weaving, I have a pretty big pool of knowledge already, so for the moment rather than try to expand my knowledge, I'm concentrating on documenting what I have. Or will be once the show season is over. For now it's in the embryo stage - the concept is swirling around in the back of my mind as I explore options and how best to put what I know onto the 'page'. I'm sure the meeting with the graphic designer next month will help - she's the expert on that sort of thing, after all. And she's a weaver - a very good one - so I don't have to explain what I'm trying to do, she already knows the language and the process. I have been blessed with good friends, near and far, who are supportive and encouraging. It's been a good life over all. Oh sure, I could have enjoyed more income, but really, I've done work that I love, even if it doesn't pay well. I don't really need a huge income - my lifestyle is modest, I don't want for much in terms of material things. 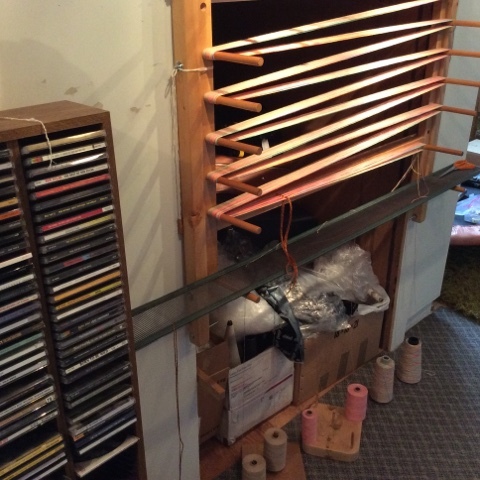 I have a fully loaded weaving studio and STASH! I get to play with string, every day. 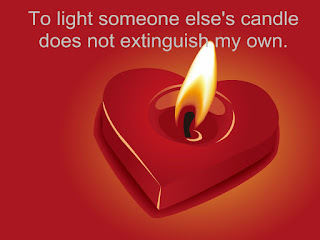 And I get to pass on my passion to others who are like minded. 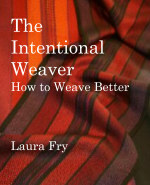 The weaving community is a small one, compared to knitting or quilting. I am proud to be a member of a community that is so filled with enthusiasm, delight in learning, pretty yarns. Not sure where I am going with this post - rambling seems to be in my blood today. Obviously it's time to get to the loom! There is about one yard to go to finish this shawl. 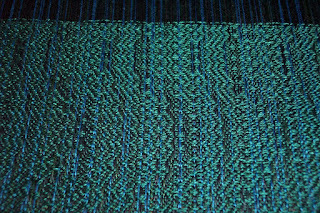 There will be warp left but I am mentally done with this warp. Deadlines are going critical and 12 shawls will be a nice addition to inventory. If I have made a mistake and there are only 11? Oh well. Time to move on. Although I have been trying to make each shawl on this warp in some way different (different tie-up, treadling or weft colour), in the case of this teal weft, I'm really pleased with how it is turning out and since I'm trying very hard to use up 'stale' stash, plus I think I have enough of this teal to do three shawls, and because it looks even better in real life than the photo, I'm on #2, planning on making three just like this. 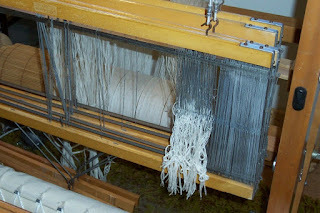 The other side of the cloth has more of the warp showing because the tie up is a 1:3:1:3:1:3:3:1 tie up which makes this side of the cloth mostly weft. I think it's going to look even better after wet finishing which will include a good hard press. The exhibitor package arrived late last night - the show organizer(s) working late into the night? I can't imagine trying to corral 300+ exhibitors into one huge event! It's bad enough just getting me ready for a show! Circle Craft has been in existence for decades. Over the years it has grown in size and stature. It is a juried show and getting accepted is not always easy or guaranteed. Doug used to do this show in the 80's when our primary product was textiles for the table. When the market for hand woven place mats collapsed in the early 1990's, we had to stop and re-think and I changed direction. It took a while to find a new niche in the market and it was only fairly recently that we went back to applying to Circle Craft Christmas Market. The season begins this year on Oct. 24/25 with the UNBC Artisans of the North sale at the university. I now have a booth in the Winter Garden (used to be in the cafeteria.) It's a small show with a focus on local artisans and they give returning exhibitors the same space each year if at all possible. Next follows Studio Fair, this year on Hallowe'en - Oct 30-Nov. 1. Then Circle Craft in Vancouver and finally Art Market in Calgary. I'm always a little leery about doing Art Market because of winter driving through the Rocky Mountains. Fortunately Doug is a good driver, well experienced on winter roads and so far we've been very lucky. Doing the shows is more than just (hoping for) income for the coming year. It is also about getting feedback from the market. It has been heartening to have repeat customers come in to get another tea towel because the ones they bought 'last' year have become their favourite and they want more. Or they want another shawl to dress up their wardrobe. Sometimes local weavers come by and it's always nice to put a face to a name seen only on the internet or talk with 'old' friends. As an introvert it is very difficult for me to be on duty, dealing with the public, but since my objective is to earn an income from my textiles, the job isn't done until it is sold. And I gather information to inform my direction for the coming year. Or nearly. I'm half way through shawl six out of an estimated 12. I wasn't sure this greyed rose colour was going to play well with the dark blue warp but it seems to be fine. It is even showing a tendency to iridescence but I will have to wait until it is wet finished to be sure. Today I started looking for my double bobbin shuttle and once again failed to find it. I'm pretty sure I used it during the DVD taping but where it got to after that? However, I did empty a plastic bin of textiles, some of which I had set aside for the DVD and which never got used. So they are now in the to be wet finished pile. I know there is at least one more bin with more, so I will try to find it, too, and get everything done in time for the fall sales. 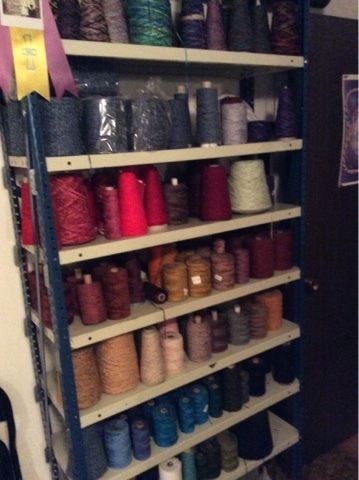 My goal is to go through all of the bins and boxes by the end of the year and clear some floor space so that I can bring more yarns over from the annex. We will see if I'm successful! Normally I prefer my weft to be closer in value to the warp and the difference in value between the warp and weft is leaving me a little unsure that it really 'works'. On the other hand, it doesn't look 'bad', just different from my usual. 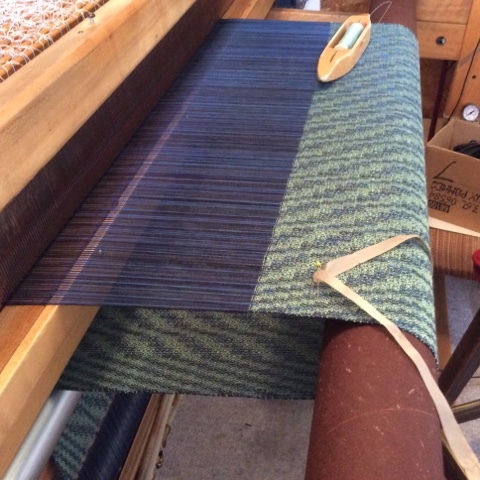 So I'm carrying on weaving shawl #5 on this warp with the green weft, hoping someone will fall in love with it. 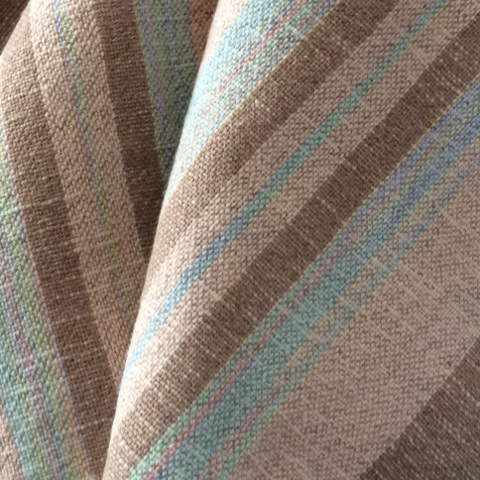 The next weft colour is even more 'daring' - it's a greyed pink, about the same value. Really unsure about whether that one is going to work or not! The colours are a little brighter in the photo than real life, but over all I am pleased enough with the results. The scarf is destined for the Cold Snap Music Festival which typically takes place in January. It has become a bit of a tradition that all the performers get something hand made to keep the cold at bay. I am pleased enough with how this is turning out that I will dig in my hand spun stash to see if there is enough of something to do another. 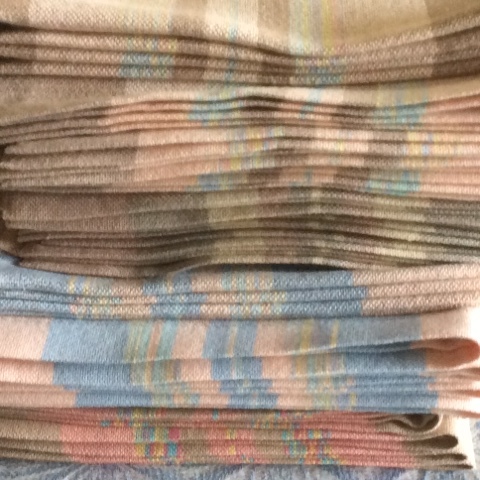 Now that the towels are woven and, even as we 'speak' being pressed, it is back to the place mats. So many people lament that before they can do the 'fun' stuff they have to do the 'awful' stuff. Stuff like winding a warp. 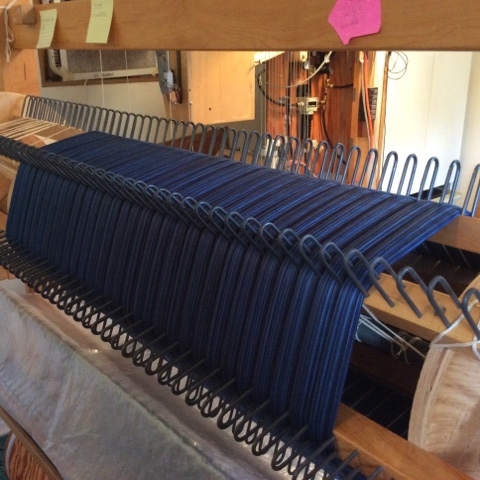 Dressing the loom. What they really need is some help. Help in figuring out why they dislike those bits of the craft so much. Why the essential prep work required to do the 'fun' stuff has become such a roadblock to their enjoyment of the craft. Why they struggle so with the part of the process that must be done in order to wind up with cloth. All of the steps are essential. Weaving is a multi-faceted craft with many different steps that bring the weaver closer and closer to their goal of a woven structure. Now, some people find parts of the process difficult because they may have some sort of impediment - physical or mental - but most of us? Most of us just need to change our attitude, change our process, change our equipment. Above all, we need to stop doing the same thing we have always been doing and expecting different results! Now that I have woven for decades, refining my tools, techniques and processes, I pretty much get the results I expect most of the time. Therefore there is no need for me to change anything. And yet I do. Whenever I see a process or tool that I believe will assist me, I will adapt what I am doing, or buy the new tool, even if it means saving up the money to make the purchase. 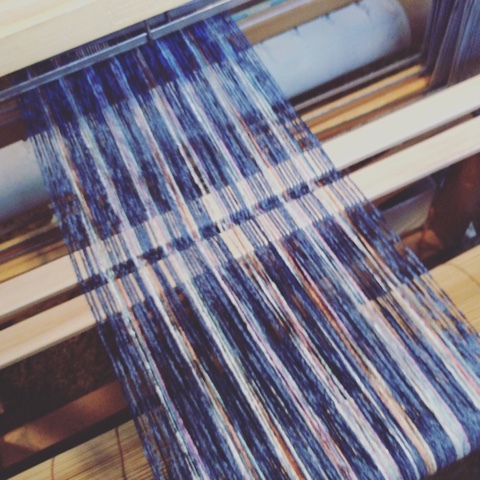 Warps get wound, beamed, threaded, sleyed and tied on with a minimum of fuss and tangles. I am practiced. I am, dare I say it, skilled. But those skills did not come easily, nor quickly. There were many potholes and bumps along the way. There were plenty of errors of judgement, short cuts that turned into disasters, projects that - quite simply - failed. 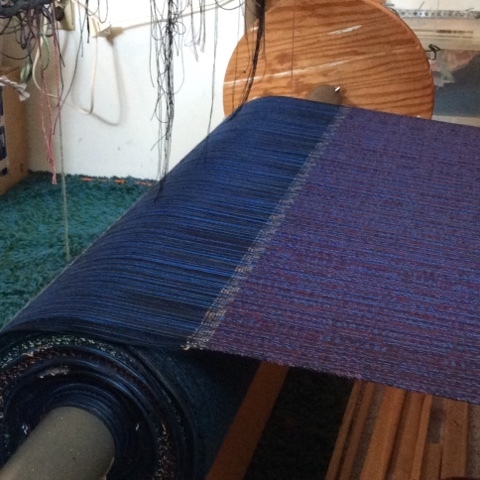 In the end, if you want woven cloth, you need to, somehow or another, get a warp on the loom. No warp, no weaving, no cloth. Simple as that. Find yourself an 'expert'. Learn all they can teach you. Decide for yourself if those lessons are appropriate to the way you want to work. Change those things that need to be tweaked. Analyze what you are doing, how you are doing it and the tools you are using. Change what needs to be changed. Seek out other 'experts'. Learn all they have to teach you. Repeat And repeat again until you learn enough to become your own expert. Different looms, different types of cloth, different materials may all require approaching them somewhat differently. Assemble the books (or whatever resources you are using), tools, materials that support you in what you want to accomplish. But sometimes the biggest change required? Attitude. Sometimes that is the most necessary step of all. One thing the Internet has done is allow people who live at a distance to stay in touch. Someone recently commented that all her 'best' friends lived far away, some of whom she hadn't actually met in real life. And to her that was a happy/sad realization. When I read that comment I realized that in many cases that is true for me, too, although I am blessed with many friends that live near enough to me that I have met them. Some of them live in my town, but we also stay in touch via emails, Facebook as well as in person. Now that I have cut back on teaching, I am not meeting nearly as many people, so if I am going to see my distant dear ones, I need to still travel. Travel that is purely for pleasure is so much less stressful, though. Miss a flight? Not a big deal. Friends will understand. Not like a room full of people who have paid money for you to show up, maybe booked time off work to take a workshop. So we have been planning some trips, just for the pure enjoyment of getting together with dear friends. In the meantime it warms the cockles of my heart when a remembrance gift arrives in the mail as happened today. With winter coming these socks will keep me warm in more than a physical sense, but also in an emotional one. 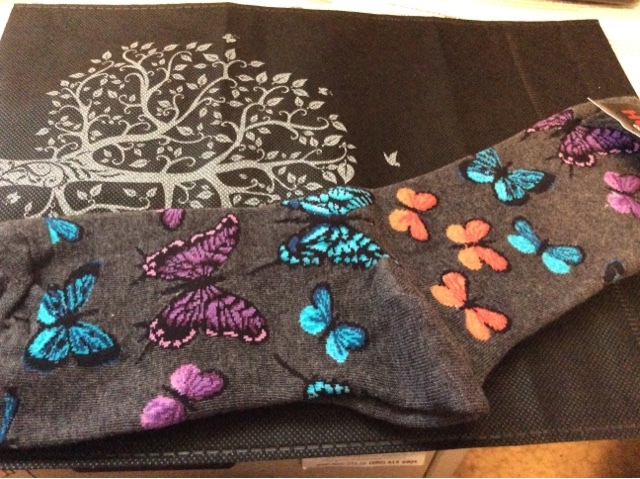 Knowing that a dear friend thought enough of me to send these uplifting socks. :). In a cute bag, too. It is time to pay attention to the calendar and the count down to the first of the shows of the season. UNBC kicks the season off with Artisans of the North, Oct. 24/25. Studio Fair follows Oct. 30/31, Nov 1. Both of these shows happen here at home so we get to sleep in our own beds and no long commute. Circle Craft takes place in Vancouver Nov 11-15 at the Convention Centre. Art Market is the following weekends Nov 19-22 in Calgary at the Telus Convention Centre. Got the last of the Mocha series towels weaving today. This week is busy with meetings and appointments but my goal is to finish this warp Wednesday afternoon, then tuen my attention to the shawl warp. Since the fringe twisting takes at least as long as the weaving, I need to get them off the loom asap so they can be finished in time. Since I will be away for a couple of weeks in October, I really need to pour on the coals for the rest of Seotember. Overall, I'm pleased with these towels although personally I'm not a 'brown' person...I think these look quite appealing. Here is the last of the Mocha series warps being wound. At 10 towels each warp, they will have boosted my inventory by 40 towels. Still haven't settled on a price for them yet because they do have linen in them, but these are 2/8 cotton rather than 2/16 so they should be cheaper...but by how much? I am really quite pleased with how they have turned out but the colour way is on the 'brown' side so perhaps not as appealing as a different colour. If I had a crystal ball that actually worked I would be able to know what would appeal to people. Ah well, that's part of the challenge! And you will notice that I really do set my tubes up so that the yarn feeds off from the end. There are lots of people who will tell you this is a really bad idea, because from one end of the tube twist will be added; from the other end twist will be subtracted. Recognizing that this might cause a problem, I decided the solution was to continue, but always take the yarn off the same way. My tubes are therefore set up to wind off counter clockwise. Why? I don't remember. But if you can't be perfect, be consistent! One of the things that comes with experience is a trained eye. An eye that will pick out inconsistencies quickly, sometimes even as they are happening, so that whatever is going 'wrong' can be fixed. This is something that really has to be experienced. While inconsistencies can be pointed out after the fact, a weaver truly becomes skilled when s/he sees them immediately so that corrective measures can be taken. It only takes changing one thing and suddenly changes need to be made. Just going from 22" to 30" in width means I am having to modify my shuttle throwing. Not a lot, and not all the time, but the rhythm of weaving action is different. Beginners sometimes think that once they know The Secret, everything will be 'perfect'. I'm here to say that day will never come! Training your eye to see the little details will help to overcome all the imperfections that exist and bring you closer to your goal. Even though these towels are far from perfect and presented some technical challenges, I am satisfied to affix my name to them and have them in my booth come October. There is a meme going round Facebook that says something to the effect that if you want me, I'll be in my blanket fort with my crayons. My loom is my blanket fort and my crayons are yarn. This warp is for shawls and I hope to use up a bunch of my Tencel stash. However shawls take a significant amount of yarn, so it will depend on whether or not I have sufficient quantities in colours that will go with the warp. 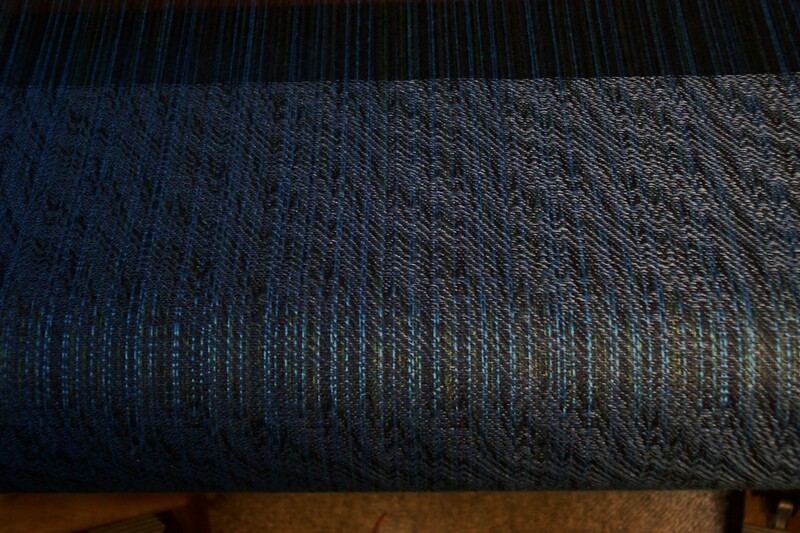 First step, though, is getting the warp threaded.